Today in Masonic History Edward Jenner is born 1749. 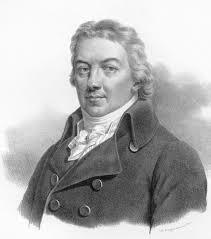 Edward Jenner was an English scientist and physician. Jenner was born Berkeley, England on May 17th, 1749. The son of a vicar he would receive a strong basic education. At he age of 14, Jenner would be apprenticed to a surgeon in South Gloucestershire. The apprenticeship would last for 7 years. In 1770 Jenner would begin an apprenticeship at St. George's hospital, lasting three years. At the hospital he received a common piece of enlightenment era advice, "Don't Think, Try". After his apprenticeship, Jenner would return to Berkeley and set up practice as a successful family doctor and surgeon. He would earn his MD in 1792 from the University of St. Andrews. In 1788 Jenner would be elected a Fellow of the Royal Society. He would publish a careful study of the nested cuckoo that including observation, experiment and dissection. Inoculation (or variolation) for small pox was already a common thing in England. It had been imported in 1720. The process involved taking scrapings from scabs of recently infected small pox victims and rubbing the scrapings into small scraps on the skin of the person to be inoculated. The results of this method though were unpredictable. Jenner would follow up on information gathered in 1765 by Dr. John Fewster who had found that cowpox had the ability to prevent small pox. Fewster would only publish a paper regarding his observations. Prior to Jenner's work with vaccination for small pox, five other investigators worked on the connection between cowpox and small pox. One even vaccinated his own family during a small pox epidemic in 1774. Again though there was no follow up. Jenner would postulate that the pus blisters that milkmaids received from cowpox protected them from small pox. In 1796 he would put this to the test by inoculating an 8 year old boy. He injected the boy in both arms with the cowpox, which produced mild symptoms. Unlike previous investigators, Jenner followed up with additional experiments. Jenner used the common inoculation technique of the time to infect the boy with small pox, no symptoms occurred. Jenner would later attempt it a second time and still no infection occurred. "Jenner's unique contribution was not that he inoculated a few persons with cowpox, but that he then proved [by subsequent challenges] that they were immune to smallpox. Moreover, he demonstrated that the protective cowpox pus could be effectively inoculated from person to person, not just directly from cattle." Jenner passed away on on January 26th, 1823. Jenner was a member of Lodge of Faith and Friendship #449 in Gloucestershire, England. He was raised in 1802.